La propriété est un camp de bord de mer spacieux situé sur les rives de Great Pond à Belgrade disponible pour la location nocturne, hebdomadaire ou mensuelle. Cette maison dispose de trois chambres, peut accueillir 6 personnes confortablement, dispose de 2 salles de bains, grand salon, grande cuisine et une belle terrasse. La maison est un choix idéal pour une famille nombreuse. Situé directement sur l'eau, a un quai privé, amarre, grill et Wifi ainsi que de nombreuses chaises longues pour se détendre et regarder les huards, les aigles et les aigles. La propriété comprend également 23 acres qui peuvent être explorées et offre de belles vues et la faune. Apportez vos kayaks, canots ou bateaux. La maison dispose d'un quai privé et d'un embarcadère public à proximité. Le lancement est situé au large de la route de Sahagian sur la route publique de lancement de bateau à Belgrade. Profitez de grillades et dînez sur une terrasse au bord du lac avec de belles vues sur le coucher de soleil sur l'eau. 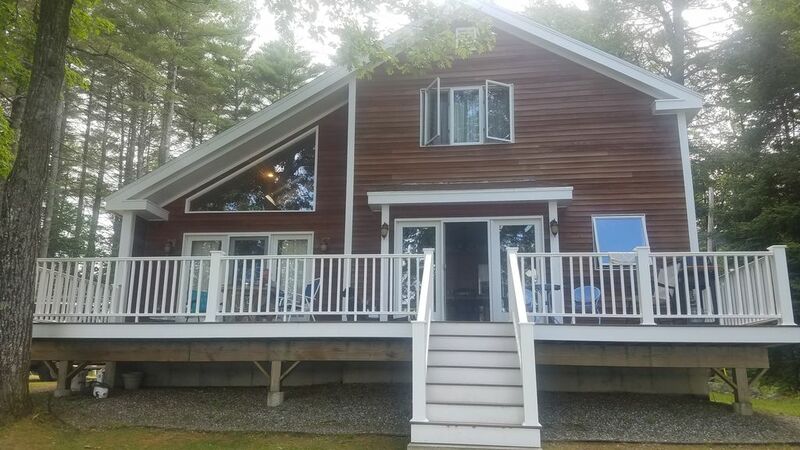 92 Lord Lane est idéal pour des vacances tranquilles, des excursions de pêche ou des réunions de famille. Ne pas fumer à l'intérieur s'il vous plaît! We loved your house and the spot on the lake was great. Thank you for allowing us to stay. Great home. Slept 6 comfortably with a wonderful spot on the lake. Nice yard with fire pit. Wonderful, quiet, beautiful home. Great spot! This home on Great Pond is in a very quiet part of the lake. There are no homes directly across the lake and homes on either side are far enough away that you do not/barely see them. The house has a fire pit and the owners had left plenty of fire wood. The grill on the deck was great to have, the owners even had an extra full tank available. The kitchen was fully stocked with everything needed to cook a meal except food. There are plenty of chairs around the fire pit and on the deck so our meals were always outside. The lake is particularly quiet and still in the morning. The lake from about where the house is to the end of the cove is designated a loon nesting site so we sat quietly sipping coffee while the sun rose watching and listening to the loons. Lake was still as glass every morning in front of the house. Details on the house are; good wifi, two bedrooms and full bath upstairs and one bedroom and full bath downstairs. Good cable channels with most news channels. Okay water pressure but then, you're at a lake house. Good enough for quick showers. Very nice gradual slope into and in the water. Dogs loved it! Wooden dock with about 4 to 5 foot depth. Our boat draws 22 inches so worked out fine for us. The road to the house goes through the owner's fields so a nice walk with the dogs. Saw wild turkeys. The owners are great about making sure we had everything so we never had to call them. We were all very comfortable and had a great time. Good on the outside. Stinky and Sticky Inside. Buyer Beware. This home looks great it photos, unfortunately cleanliness and smell do not convey. We ended up leaving 3 days early. We only stayed that long because we were throwing a party for my parents and had family from everywhere visiting. We got there and the place was filthy. Pet hair everywhere – literally. I even pulled a blanket out to put over the couch so we could sit,, at too was covered in hair. What was worse was the smell, can’t get this from a photo. It smelled like “old” and pet urine. The carpets were nasty and stained. The house was top-to-bottom dirty. I have all the photos to prove it .There is no A/C unit, and what they don’t tell you is that the screen doors don’t lock so you cant leave the doors open at night. Enjoy having the smell wafted into your face by the fan while you sleep. No washer/dryer, well there IS one. Guests are just not welcome to use. Its in the locked basement. Creepy. And you can’t TRULY ever lock the house since the door to the garage, locks from the OUTside. Floors are nasty, I don’t think they ever mop. Sofa filthy, I think there was mouse poop. Food stuck to utensils. I can go on but there is a char limit. The broken chair knocked my four year old over when the footrest sprung out as he tried to get off it. Dog.Hair.EVERYWHERE. literally. We vacuumed, swept and it just kept coming. It doesn’t advertise as a pet friendly home. Pros – The home has excellent potential, the water and shore are beautiful. Firepit was great, the patio is beautiful, and its very private – except for the neighboring dog that kept coming over and the man coming to retrieve it. Swimming was good, the water snake – not as much. We paid prime rates for this experience. We notified the property owner immediately, who sent someone out to clean, they said they did, but they did not. After a couple of days, I have in writing that the property owner offered to refund us if we chose to leave, so we made plans (and subsequently did) . THEN she wrote back to tell us that they changed their mind, and were refusing to refund us after all. Knowing I was angry, they then offered to move furniture and even rip out the carpet. All during our stay – uh, no.Please do your renovations on your own dime. I lost count how many times I called VRBO. They said they filed an official complaint and were getting back to me. After several calls to ask the status, I’m still waiting… going to cut my losses. They just took my money. End story. We are very sorry that your stay fell short of your expectations. Cleanliness is of utmost importance to myself and the property owners. As always, we use a professional cleaning service to deep clean the property after each guest has checked out. We also use this company for a start of season deep clean as well as an end of season deep clean. As you can see from all other 5-Star reviews, cleanliness has never been an issue. If you read through the property listing details, this property does not advertise AC units or washer/dryer units. However, each room is equiped with a fan and there are many windows throughout this camp that allow for a refreshing day and night time breeze. This property is also listed as Pet Friendly. We know the importance of pets and love when guests get to experience vacation with their four legged friends. As far as security at this property all windows, doors, screen doors and garage doors come equipped with locks. The main entrance uses a code to lock/unlock the door. We are very happy you enoyed the lake, firepit and privacy of the property as this is what vacation is all about. This property allows you to truly enjoy all of the wonderful things the lake has to offer. We are confident that future guests will not share your experience and we look forward to helping the property owner continue to provide a 5-star stay for every traveler that visits this property. This home is a hidden gem. There is so much space for people to feel comfortable, and still gather round the table nightly, like we did. We love having the firpit outside by the water to watch the loons and nature. The house was nice and clean, and was equipped with whatever you may need. We loved taking our dogs for nice long walks in the nature around the house. I really hope we can go back in the summer to swim in the clean lake! Beautiful home! Well suited for having children stay there too. We had a wonderful vacation and hope to rent again in the future! Owners are very friendly and helpful in giving recommendations of things to do in the area!